Every morning you will find the Breakfast buffet with fresh fruits and biological products. Later, enjoy a drink at the Bar. Relax in the outdoor swimming pool with hydro massage, sun loungers and solarium. The 90sq.m. Swimming pool, provided with hydro massage, is situated in the garden. Sun loungers, tables and chairs around the pool. Opening time: 9.30am – 7.30pm. Green and relaxing garden at the entrance of the Hotel, under the evergreen olive trees and flowers. Hotel Casa Antonelli, located on a hill overlooking the lake has a unique panorama. The roof terrace offers an impressive view of the lake, the right place to enjoy a drink at the sundown. Free Wi-Fi in all areas of the Hotel, password upon request at the reception. Air conditioned, cooling and heating, is in all the rooms. The air conditioned, included in the rate, is available from 8.30am until 10.30am and from 5.30pm until 2.30am. Lift to reach the 1rst and 2nd floor is with panoramic view over the lake. Free private parking close to the entrance of the Hotel and secure and covered bike parking. We have 4 bikes available upon request. A small lounge bar with seats and tables, for the coffee time or for tasting our local bio-wines, such as Bardolino, Valpolicella, Bianco di Custoza, Lugana. The awakening at Casa Antonelli is in harmony with the Hotel's location as well as with the different seasons and with the freshness of the breakfast. A various and natural breakfast is the best start of the day. The traditional family style hospitality give a sense of quiet, away from the frenzy. The breakfast is served from 8.00am and 10.00am.Varied buffet of bio products, including cold cuts, cheese and fresh pastries, yogurts (natural and flavored), boiled eggs, cereals, selection of bread. German or American coffee, espresso, cappuccino or latte macchiato served at the table. According to our philosophy, three times a week we serve, upon request, a vegetarian dinner. Our experienced cook Lila suggest a various selection of menus, vegan or vegetarian, by using bio integral products, such as rice, pasta and cereals according to the Ayurdevic tradition. The main ingredients are: TOFU, SEITAN, TEMPEH. TOFU: Also known as bean curd, is a food made by coagulating soy milk and then pressing the resulting curds into soft white blocks. Tofu has a subtle flavor and can be used in savory and sweet dishes. It is often seasoned or marinated to suit the dish. SEITAN: Is a food made from gluten, the main protein of wheat, it is commonly found on the menus for customers who do not eat meat. TEMPEH: Is a traditional soy product originating from Indonesia, made from soybeans. We also offer possibility of booking your transfer min. 3 days in advance from and to the Airports of Verona and Bergamo. Contact us here if you would like to use our shuttle service. Casa Antonelli invites you to explore Lake Garda on a free guided tour. Every week you make walks to illustrate the natural beauty of Lake Garda. Click here to view our excursion programme. 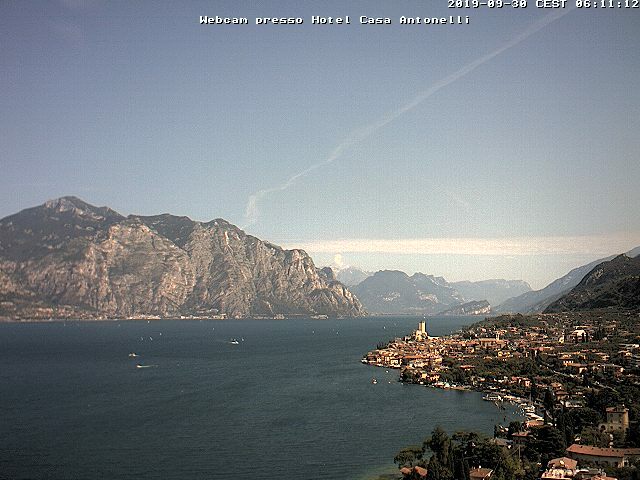 A Webcam positioned on the roof allows you to see the live weather, the view of Malcesine and the north side of the lake including the Monte Brione.